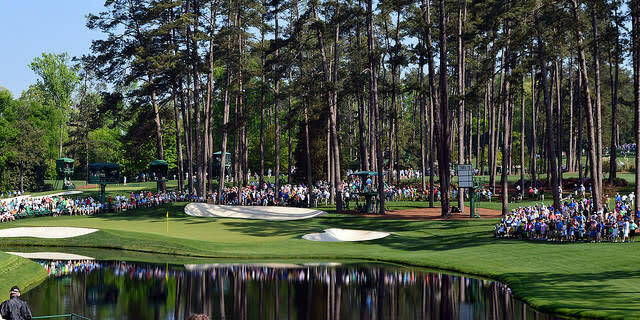 Home of the Masters Tournament since 1934, Augusta National is arguably the most iconic golf course on the planet, sitting alongside the Old Course at St Andrews and Pebble Beach for that accolade. The one major played at the same venue each year, we have a connection to this layout unlike any other, having seen moments played throughout decades. We've seen it all before. We know the potential for greatness. The lurking disaster. It's what makes the Masters special. 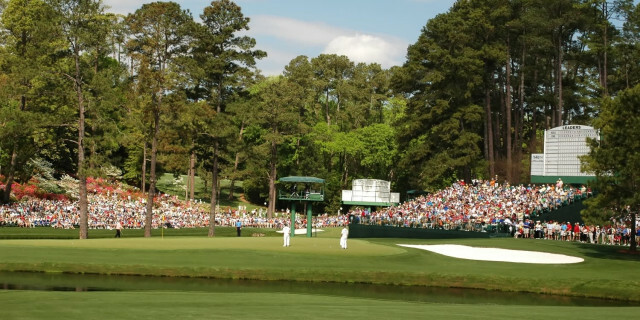 But Augusta has continually evolved, not to always to everyone's liking. We take a closer look at 18 holes of this legendary course, where the players of today will walk in the footsteps of legends. 1st (Tea Olive), 445 yards, par four: A deep bunker on the right of the fairway and trees both sides make for a daunting start, while long and left of the undulating green both spell big trouble. Hardest hole on the course in 2012 and 2017. 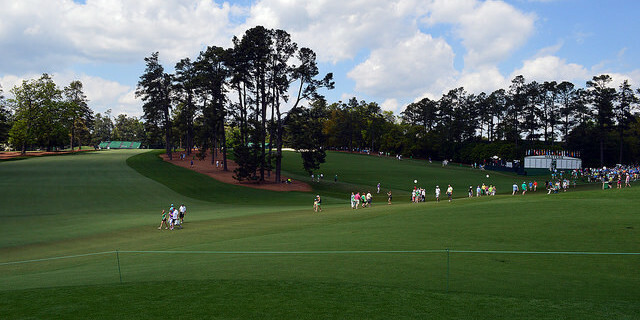 2nd (Pink Dogwood), 575 yards, par five: Driving into the trees on the left cost Padraig Harrington a nine in 2009, but Louis Oosthuizen holed his second shot for an albatross in the final round in 2012. An important early birdie chance and the easiest hole in 2016. 3rd (Flowering Peach), 350 yards, par four: Shortest par four on the course but a pear-shaped green with steep slope in front allows for some wicked pin positions. Charl Schwartzel pitched in for eagle in the final round en route to the title in 2011. 4th (Flowering Crab Apple), 240 yards, par three: The back tee turns it into a beast with the green sloping from back to front. Phil Mickelson took six here in the final round in 2012 and finished two shots outside the playoff. 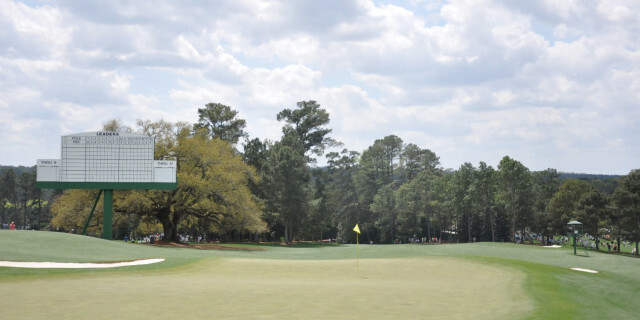 Jeff Sluman’s ace in 1992 remains the only hole-in-one here in Masters history. 5th (Magnolia), 495 yards, par four: Jack Nicklaus twice holed his second shot in 1995 and Colin Montgomerie did it in 2000, but it is a difficult green. To clear the fairway bunkers requires a 315-yard carry and the hole has been lengthened by 40 yards for 2019. 6th (Juniper), 180 yards, par three: Played from a high tee to a green with a huge slope in it. Jose Maria Olazabal took seven in 1991 and lost by one to Ian Woosnam. 7th (Pampas), 450 yards, par four: Used to be a real birdie chance but has been lengthened by 40 yards, while trees were also added and the putting surface reshaped. More bunkers - five - around the green than any other hole. 8th (Yellow Jasmine), 570 yards, par five: The bunker on the right, about 300 yards out, pushes players left and from there it is harder to find the green in two up the steep hill. Still a good birdie chance. 9th (Carolina Cherry), 460 yards, par four: The tee was pushed back 30 yards in 2002. 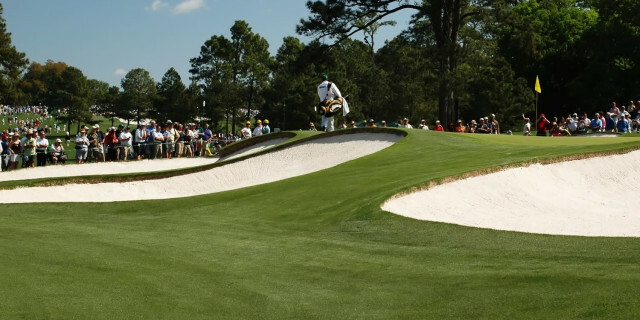 The raised green, with two bunkers on the left, tilts sharply from the back and anything rolling off the front can continue down for 50-60 yards. 10th (Camellia), 495 yards, par four: A huge drop from tee to green on this dogleg left and over all the years of The Masters the most difficult hole. 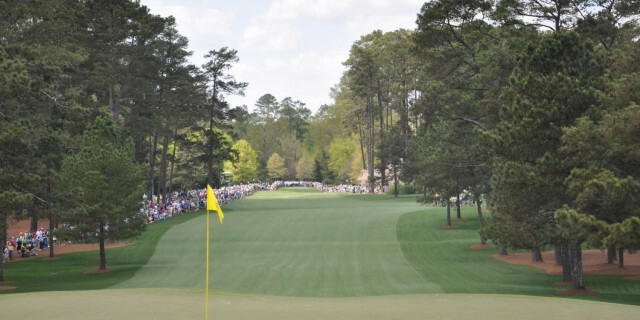 It was here that Rory McIlroy began to fall apart in 2011 with a seven, while Bubba Watson clinched the title in 2012 by making par in the playoff from the trees. 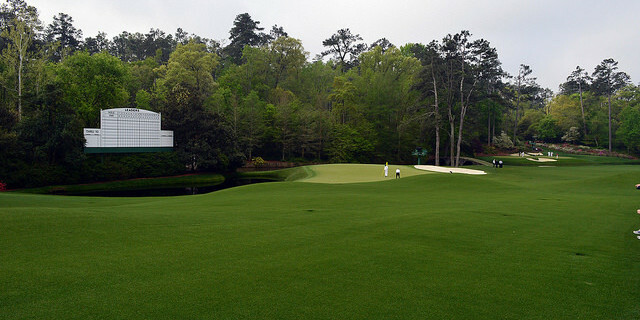 11th (White Dogwood), 505 yards, par four: The start of Amen Corner. Toughest hole in 2011, 2014, 2015 and 2018, with the water front and left scaring many. Best remembered for Larry Mize’s chip-in in 1987 and Nick Faldo’s back-to-back playoff wins. 12th (Golden Bell), 155 yards, par three: Probably the most famous par three in golf. Narrow target, water in front, trouble at the back, it has seen everything from a one to Tom Weiskopf’s 13 in 1980. Defending champion Jordan Spieth took seven in the final round in 2016 in a dramatic back-nine collapse. 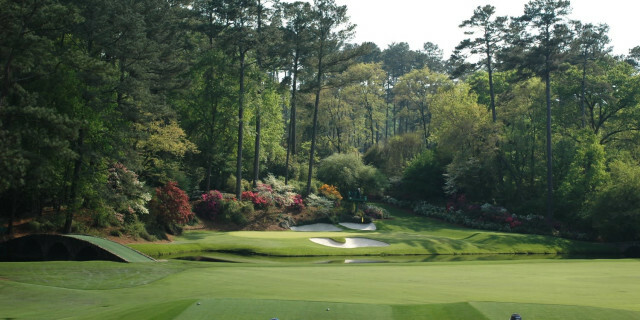 13th (Azalea), 510 yards, par five: The end of Amen Corner. Dogleg left with scores ranging from Jeff Maggert’s albatross two in 1994 to Tommy Nakajima’s 13 in 1978. Sergio Garcia saved par after a penalty drop from a bush in 2017, went on to beat Justin Rose in a playoff and named his first child Azalea the following year. 14th (Chinese Fir), 440 yards, par four: The only hole on the course without a bunker, but three putts are common on another difficult green. Nick Price took eight here in 1993, while Phil Mickelson holed his approach en route to his 2010 victory. 15th (Firethorn), 530 yards, par five: Often a tough decision whether to go for the green in two across the pond on the hole where Gene Sarazen sank his 235-yard four-wood shot for an albatross in 1935. There have also been three 11s here. And Sergio Garcia ran up a 13 last year. 16th (Redbud), 170 yards, par three: Tiger Woods’ memorable chip-in in 2005 came the same year as 73-year-old Billy Casper’s 14, while Padraig Harrington, Ian Poulter and Shane Lowry are among 19 players to record holes-in-one. 17th (Nandina), 440 yards, par four: The famous Eisenhower Tree has been removed after suffering storm damage, making for an easier tee shot on the hole Justin Rose double-bogeyed when one off the lead in 2007. Jack Nicklaus birdied here to take the lead as he won his 18th major in 1986. 18th (Holly), 465 yards, par four: The drive through an avenue of trees was made much harder when the tee was moved back 60 yards in 2002. The fairway bunker from which Sandy Lyle got up and down to win in 1988 is now 300 yards away.